Most of the organizations that handle large amount of data is very much dependent on MS SQL Server for their operations. However, an MS SQL database corruption, can cause a lot of troubles to the organization owing to the criticality of the data contained in the database. Fortunately, many SQL Server recovery tools are available in the market. We will try to understand the features, working, and benefits & drawbacks of a popular, SQL recovery tool—the Kernel for SQL Database. Lepide Software, the developers of Kernel range of products, is known for sophisticated IT security, management, and recovery solutions. Its Kernel range, designed and developed for small and mid-sized organizations offers cost-effective solutions for most of the day-to-day issues faced by IT organizations. These products help organizations in email migration, email recovery, data recovery, file repair, and more. The company has a loyal customer-base spanning across the world owing to its quality products and dedicated customer support. The demo version, meant educate users on SQL recovery process, is completely free. But it is not equipped with the saving facility. Licensed version is the fully featured version of the software and is available on purchase only. It can save all the recovered data. 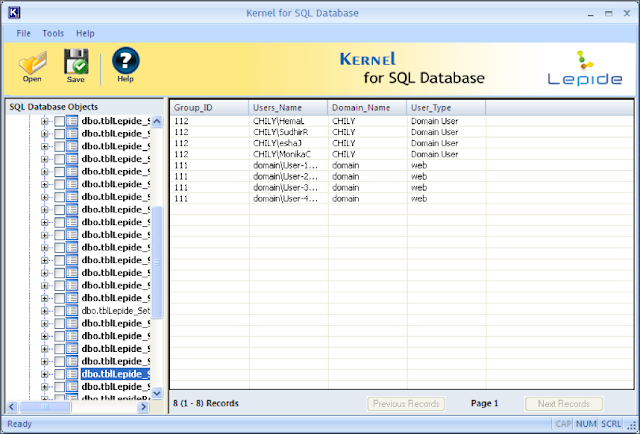 How to use Kernel for SQL Database to repair corrupt MDF files? The Open button (in the main page of the software) opens the Select SQL Database dialogue box. In this dialogue box, one can browse for the corrupt database. 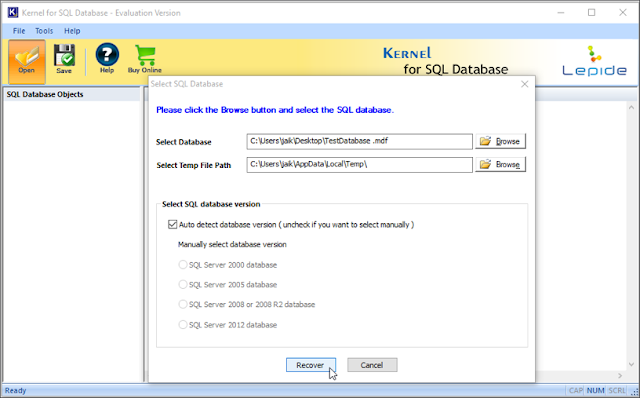 If users are sure about the SQL server version, the can select the version. Otherwise, they can use the auto detect option. Finally, the recovery process can be initiated by clicking the Recover button. Once the software displays the recovered objects, the users can click an object on the left tree to preview its data. 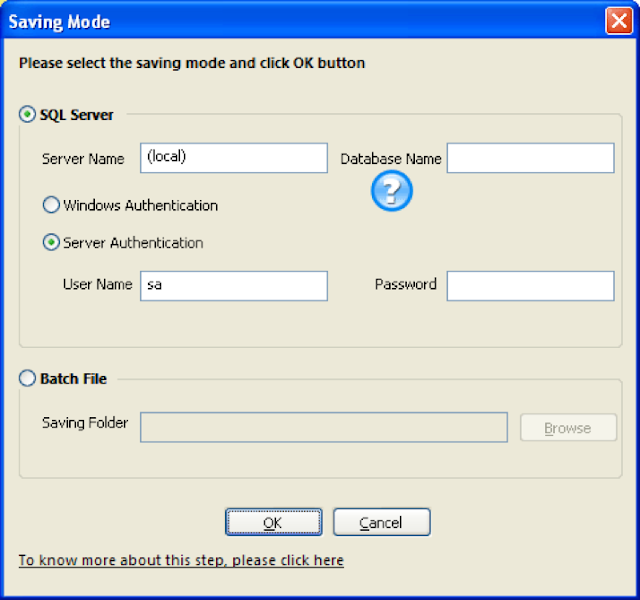 Two saving options are available—saving to SQL Server and saving to batch file. The first option allows to save directly to an SQL Server either through server authentication or through Windows authentication. In the Batch File option, the data is stored in script files in the desired location (which can be copied to a new database). The software interface itself provides information on how to execute the recovery process. So even non-technical users can perform recovery without any help. Everything recovered can be viewed on the software’s preview pane before saving. Previewing helps users to know about the recoverability of the data. If the users know the version of the SQL, they can select it. But if they do not know, the software can automatically detect the SQL version. The software saves the recovered MDF file files to SQL Server directly. In addition, it can save files in batch file, which users can copy to a new database when required. The trial version of Kernel for SQL Database cannot save the data. With this version, users can only preview the data.